I grew up about an hour outside of Philadelphia – a hub of culture, art, and United States history. Being introduced to the arts and science (I still, in my late twenties, love to touch things in the Franklin Institute) at a young age, Auguste Rodin’s sculptures are amongst my earlier memories. I always stared at them the longest and hardest, waiting for them to breathe. You should also know I stood quite a distance away because works like Adam (bronze, modelled 1880-1881) are fairly frightening for a ten year old. It’s said that marble is the most flesh-like material; naturally cold and hard, it needs to be warm and supple to produce the desired effect. An effect which Rodin always managed to take a bit further in all of his works, whether marble, bronze, or plaster. Viewing the lovers of Eternal Springtime (Philadelphia Art Museum, plaster, modelled 1884), it appears as if they are simply holding their breath for passers-by because they’ve been caught in a private moment and hope to be ignored so they can continue with their business. August Rodin, Eternal Spring, or Eternal Springtime, probably modelled 1881, executed 1906-1907. Greatly admiring Michelangelo, Rodin strove to equal his mastery of the human body so far as giving life to his statues. I would argue that Rodin accomplished this goal many times over, before even travelling to Italy to better study Michelangelo’s works. Depending on the piece, sadness, happiness, strength, despair, or love exudes from Rodin’s masterpieces. The Danaïd daughters, subsequent to murdering their husbands after betrothal (49 of the 50 girls), were sentenced to the Underworld and forced to carry a jug of water to fill a bottomless bath to wash away their sins. 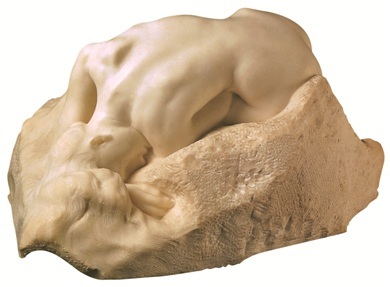 In Rodin’s recreation, the back is beautifully rendered, as is the nape of her neck, but most of all she oozes despair at the profound error of her sin. Marble, 36 x 71 x 53 cm. The Musée Rodin, already a breeding ground for magnificence and splendour, is exhibiting Rodin, flesh and marble now through 1 September 2013. You’ve got plenty of time to go and experience all of the emotions and see the intricacies of Rodin’s masterworks. Also, Auguste Rodin by Rilke is sure to be a much appreciated gift this holiday season! Wonderfully written and breathtakingly illustrated, don’t miss out on these books (Rodin by Rilke) about nearly-modern day Rodin!